An excellent article quoted from the Cody Enterprise on YellowstoneInsider.com tells about the remarkable turnaround in the fishing scene in our oldest national park. Since the mid 1990s, when large lake trout were introduced into Yellowstone Lake from an unknown source, the carnivorous fish have been devouring native cutthroats, a so-called keystone species. 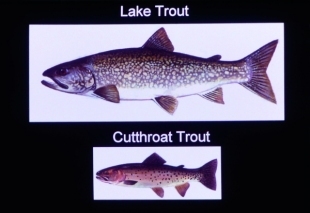 Combating them has been a struggle, since lake trout swim and spawn in the deepest water, while cutthroat trout swim near the surface and spawn in inlet streams. Two major non-profit organizations that give support to Yellowstone are merging. Governing boards for the Yellowstone Association and Yellowstone Park Foundation have recently voted to become one entity, merging philanthropic and educational programs into one umbrella organization. The merger will be complete by spring 2016 and fully in effect by February 2017, with a new name and website, creating a single non-profit with 50,000 supporters. Back in 1933 supporters formed the Yellowstone Library and Museum Association to preserve the park’s history and provide educational services. Later simplifying their name to Yellowstone Association, the organization began in 1976 to offer instructional courses that “highlight the park’s amazing wildlife, geothermal areas, rich history and awe-inspiring wilderness.” It also provides funding to the research library and Yellowstone Science magazine. As a member of YA I have personally profited from over twenty of the extremely well-taught courses offered by the Yellowstone Institute, and I’ve found the library (open to all) indispensable for my research. 1996: Began ongoing funding for the Yellowstone Youth Conservation Corps. 2001: Acquired the remarkable Davis Collection of thousands of pieces of Yellowstone memorabilia and historic items. 2008: Funded the restoration of Artist Point overlooking the Grand Canyon of the Yellowstone River. 2010: Contributed to the new Old Faithful Visitor Education. 2013: Completed moving and restoring the historic Haynes Photo Shop near Old Faithful Geyser. Granite Peak Publications is proud to be associated with these organizations and with Gateway Businesses for the Park, a project of YPF. As a guidebook publisher, I try to keep up with what books come out that help people enjoy and learn about Yellowstone. So, when there’s a new guidebook announced, I always take a good look at it—maybe even buy it. This past February  the famous Michelin tire and guide company threw their hat in the ring with The Yellowstone Park Foundation’s Official Guide to Yellowstone National Park, partnering with the Yellowstone Park Foundation. They’ve produced a slim and lightweight book that would fit nicely in many pockets, with quite a few colored pictures borrowed from the National Park Service and the YPF itself. The only maps are in the fold-out front and back covers and show the seven regions they’ve divided the park into and the road system, with stars for a few recommended features and areas. A nice touch in this book is the “Insider Tips” by several park experts. But ironically this is not the only “official” guide you can buy today. The other appeared first in 1997 and is a large format (magazine-size) book, which I notice grows thicker with each new edition. Called Yellowstone: The Official Guide to Touring America’s First National Park, this one also divides our large park into seven areas. It’s published by the Yellowstone Association, another of the non-profit organizations centered on Yellowstone. It has sectional maps showing facilities and interesting features in several different regions. The large colored pictures will delight many. Both of these guides are good contributions to Yellowstone bookshelves. Still, I cannot help but be amused at the word “official” in both guides’ titles. My dictionary gives “authorized” as a major synonym for “official,” but I fail to find in either guide by whom or what agency they were authorized. Should Yellowstone Treasures also seek to become “official”? When I opened the e-mail message this morning, my heart sank. Another guidebook to Yellowstone announced! This one is backed by the Michelin tire corporation and the Yellowstone Park Foundation (to which I belong). Wow! There’s no competing with that. Both solid and respected entities. I even wrote to Michelin way back when I was seeking a publisher for Yellowstone Treasures; got a polite refusal back from them—but then, I wasn’t the YPF. So I’ve ordered a copy and will add it to my shelf of Yellowstone guidebooks. It’s a 106-page book and will certainly be more portable than my book’s pound-and-a half. I always learn something from the guidebooks I see, but I can’t lessen the bulk of mine and keep all the pictures and words I want to include. I’ll go on working on the next edition of my book and probably find that quite a few people will want what a more thorough treatment of the greatest place on earth has to offer. After all, more than 50,000 readers have wanted and bought Yellowstone Treasures in the past ten years. Late summer visitors—Don’t miss the new visitor center at Old Faithful! Comments Off on Late summer visitors—Don’t miss the new visitor center at Old Faithful! For everyone planning to be in Yellowstone later this month [August 2010], you are invited to attend the dedication of the large new Visitor Education Center that has gone up during the past year and more at Old Faithful. The center will be dedicated at 11:00 am on August 25th in a ceremony with Superintendent Suzanne Lewis, special guest National Park Service Director Jon Jarvis, and keynote speaker Paul Schullery, a Yellowstone historian and author of many books about the park. For children of Junior Ranger age (5 to 12) there’s to be a Yellowstone Wildlife Olympics that day at 1:00 pm. For details see: http://ypf.convio.net/site/News2?page=NewsArticle&id=5415. The Yellowstone Park Foundation is proud to tell us that the new building uses about one-third less energy than other similar size buildings, contains high percentages of recycled materials, and that interior furnishings contain raw materials such as cork, flax, and wheat for sustainability. And here is yesterday’s news about park visitation: More than 957,000 visitors entered Yellowstone in July 2010. That’s the most ever recorded for any single month. I’m excited about the prospect of a new look for the area that I almost think of as my second home. This summer I celebrated the seventieth year since I first spent a summer at Old Faithful; my husband and I gave a small party in the Inn. I remember visiting the small ranger station and museum that was in the same spot where the huge new visitor center is now being completed. I am happy to think that many other people will be able to find and appreciate all the aspects of the Old Faithful area, and not just dash in, watch an eruption of the famous geyser, and go off somewhere else.